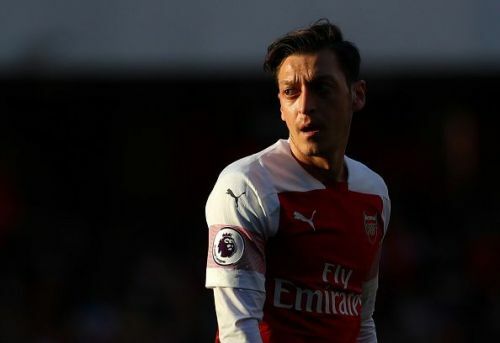 Former Arsenal goalkeeper Bob Wilson has showered praise on playmaker Mesut Ozil, calling him "the most naturally gifted footballer" he has seen in a long time, but believes that the German also has the ability to frustrate his fans in equal measure. This season saw Ozil going in and out of Unai Emery's squad as the new boss continues to sideline the midfielder citing either injury or illness. The German has only started 14 of Arsenal's 28 Premier League games so far this season during which he has netted four goals and provided two assists. Ozil has earned a polarising reputation at the Emirates as he produces the most beautiful bits of magic on his best days, but displays lacklustre and forgettable performances on his worst. The 30-year-old midfielder started his first game since January in Arsenal's 5-1 rout of Bournemouth on Wednesday, providing a goal and an assist during the clash. Wilson has weighed in on Ozil's career at the Emirates and his absence this season, stating that while Arsenal are missing a creative player to fill the void in the midfield, it is always a gamble to play him as one cannot be sure which side of him will show up. Speaking to Love Sport Radio, the former goalkeeper said, "This is the most frustrating footballer ever connected with the club that I love, adore and would do anything for." "He is the most naturally gifted footballer I've seen for a long time. He sees things that other players don't see. "He scored a goal against Bournemouth where, as he was one against one with the keeper, he bounced it into the floor. It was such an extraordinary skill. "It's almost like a trick shot to be able to do that when you're on the run and one-on-one. He could have lifted it or bent it round but he actually bounced it and we've seen him do it before." The Gunners legend added that Ozil's impressive showing against Bournemouth was proof of what the team is missing. "His performance showed what Arsenal are missing in not playing him. "But there is obviously a frustrating side to him in that you're not quite sure which player is going to turn up on any one day because Mesut on his day is capable of wowing any audience and then he can be so frustrating knowing that there is so much there in the tank." Arsenal will go head-to-head with neighbours Tottenham Hotspur in an exciting clash tonight.